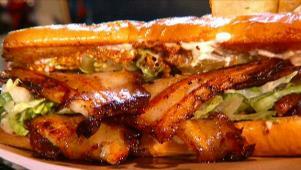 Guy Fieri rolls in for serious sandwiches; In Hollywood, Fla., a second generation hoagie shop where they're making authentic Philly cheese steaks on homemade rolls; in Portland, Ore., a cafe where they're serving house-cured pork belly on the Reubens, and a salt cod sandwich comes with chorizo; and in Chicago, a diner doing open-faced Thanksgiving dinner and Sunday pot roast on a bun. At Bunk Sandwiches, in Portland, OR, Guy samples a pork-belly Reuben. Guy finds a diner that serves Thanksgiving dinner as an open-face sandwich.